Degenerative osteoarthritis is common in post-menopausal women resulting in deformity, swelling and pain in finger joints and knee joints. Recent medical research shows that menopausal estrogen deficiency is a direct cause. In addition, bioidentical hormone replacement (including estrogen) prevents osteoarthritis. 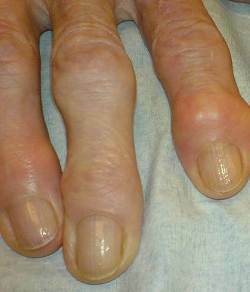 Above left image: Typical changes of osteoarthritis of the finger joints, courtesy of wikimedia commons. A study was in the 2010 Journal of Osteoarthritis Cartilage by Dr Riancho from Spain (6) explored the association of genetic abnormalities with severe osteoarthritis (OA) in 3147 patient who were compared to 2,381 normal controls. (6) The authors examined two abnormal genes which reduce estrogen activity. These are the gene for the Aromatase Enzyme, and the gene for the estrogen receptor (ER-Alpha), and their association with severe osteoarthritis (OA). Thus, the genetic studies also indicate the importance of estrogen in preserving joint cartilage and preventing osteoarthritis. Another sheep study published in 2005 in Osteoarthritis Cartilage by Dr MA Cake from Australia examined the effect of estrogen depletion (ovariectomy) on articular cartilage of the joints, and the production nitric oxide synthase (iNOS). (13) At 26 weeks after removal of the ovaries, the joints were studied histologicaly, and amounts for nitric oxide studied. There is now overwhelming evidence from both animal and human studies that estrogen deficiency causes osteoarthritis, and that bioidentical estrogen replacement after menopause prevents joint degeneration. Semin Arthritis Rheum. 2009 Oct;39(2):71-80. Primary osteoarthritis no longer primary: three subsets with distinct etiological, clinical, and therapeutic characteristics. Herrero-Beaumont G, Roman-Blas JA, Castañeda S, Jimenez SA. Source Bone and Joint Research Unit, Service of Rheumatology, Fundación Jiménez Díaz, Universidad Autónoma, Madrid, Spain. Curr Opin Rheumatol. 1998 May;10(3):269-72. 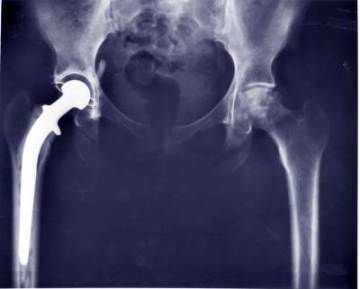 The effects of estrogen on osteoarthritis. Felson DT, Nevitt MC. Source Boston University School of Medicine, Multipurpose Arthritis and Musculoskeletal Diseases Center, MA 02118-2526, USA.